Whether you want to hear it or not, some aspect of social media pops up every day, everywhere. From the seemingly endless stream of notifications on our phones to the share buttons within the content we read online, to the time spent engaging and interacting with various communities during our daily routines. Social media is now a way of life. The primary reasons for social media’s popularity are that it is versatile, intuitive, and supports a wide variety of media types. Because of these factors, businesses can use the ever-evolving platforms to interact with prospective customers and improve client retention, directly advertise, and raise brand awareness to targeted demographics, ultimately increasing traffic conversions. For businesses today, an effective social media strategy is vital because of the growth potential it offers and the convenient market access to millions of users for a meager cost. Let’s take a look at the areas where social media can significantly and positively impact your business. Digital Advertising: Social media allows businesses to create advertising campaigns that target a specific audience with laser-like precision, which traditional advertising does not allow for. This means that the advertising campaigns will hit target prospects who are much more likely to provide a higher return on investment (ROI) as you are more likely to see higher conversion rates. In addition to this, social media advertising is a considerably less expensive avenue than traditional advertising as you pay significantly less to impact a broader prospective audience. Further, digital advertising can be executed at your own pace as businesses can enjoy growth without sponsored or paid campaigns simply by engaging with their customers and prospects via social media platforms for free. Lastly, because social media platforms offer robust analytics tools, businesses can monitor ad campaigns in real-time and tweak or ax those not returning maximum ROI. Brand Awareness Boosts: Social media platforms are all about building up authentic conversations with your target audience. When you know who your target audience is, you can employ eye-catching visuals, engaging discussions, and credible original content to build up brand authority. The more you genuinely engage with your audience, whether that be through content curation or original content, the faster your brand will grow. Diversified Inbound Traffic: One of the most significant benefits of inbound traffic from social media to a business’s website is the fact that it is diversified across your targeted audience. This means that you are getting the best value because those who click-through from your social media profiles to your website are doing so because they are interested in what your business offers. In addition to this, when a business shares content from their site onto social media, it increases their sphere of influence and reach ten-fold. 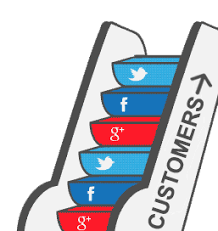 Increased Customer Satisfaction: Social media allows businesses to offer a more personalized level of customer service. This is done by monitoring conversations between customers and your brand, providing customers with announcements and news, and by connecting with customers through question and answer sessions. Essentially, social media platforms open up the conversation for constructive feedback, which can be used to better understand your audience and provide them with what they truly want – not what you want to tell them they need. Increase Brand Loyalty: By being consistent with value-oriented content, customers will want to come back to you again and again because they will feel like they are sharing and consuming relevant and impactful content that adds some sort of value to their lives. Also, when content is consistent and filled with personality, it makes it easier for your customers to connect with you, which in turn affects how often they engage with your brand. Improved Search Engine Optimization: When social media profiles are kept fresh with engaging content and relevant contact information, it keeps your business’s online presence strong, increasing your exposure and perhaps more importantly, your search engine rankings. The more social media profiles you have that are active, the more likely you are to be found on the web through a web search. The number one reason for this is due to social media profiles and links dominating search engine results. Social media platforms are no longer just a personal option for individuals, but instead, are a crucial tool that businesses should be utilizing due to the impact, user-base, and diversity they provide. When a company can sign up for free and reach millions of users who may be interested in their brand, products, and services, there really isn’t a good reason to pass up on that opportunity.